The garden at home can create atmosphere of calm and sanity itself. Plant variety that is also able to cleanly produce the beautiful mosaics. This of course will have positive impact. Complement the garden is home. Design a beautiful and unique will make the stand. Create and design a garden at home is actually not too difficult. However, this should be adjusted to the conditions and the wide house. 1. Adjust the number of plants with a wide area. To find out how many plants required to meet the land, the formula used was the area divided by the diameter seeds. For example, if the available area 1000 square centimeters, while the diamater seedlings 25 centimeters, the number of seeds required is 40 units. 2. If you do not have the remaining land that can be made garden, then choose one of the corner of the room to create a garden. But, this park is not permanent and temporary. You can select a corner of the living room, family room, the room or the other. 3. Choose plants according to the situation and conditions area. If the garden outside the room, where sunlight can be free, choose the appropriate plants. Some types of flowers can be a choice for the type of this garden . But if the park is in the room, select the type of plants that fit in the room (indoor plant), or the like calm. Choose plants of varying size. Create plants according to size so that the administration order to create a beautiful and interesting. 4. For the garden outside the room before the planted land, or be stirred first. This is so wild grass and weeds can die down to the root. 5. To create the more value the beauty, you can complete with garden accessories. 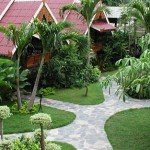 For example, install the garden with a variety of beautiful design and interesting.